Dotted off the coast of West Africa, the 10 islands of Cape Verde are as varied and fascinating as they are beautiful. With tropical beaches, lush mountains, year-round sunshine and direct 6-hour flights from the UK, they offer high standards at a fraction of the price of many African destinations. An archipelago of ten sun-kissed islands off the coast of West Africa, Cape Verde offers holidaymakers miles of white sandy beaches, towering green mountains and a beautifully eclectic culture. As the destination specialist, we offer holidays to seven of the ten islands. 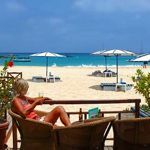 Year-round sunshine and average temperatures ranging from 24 – 30ºC make Cape Verde a superb place to visit whenever you like, and with so much on offer to explore, it successfully caters to all manner of travellers. Taking around six hours, we offer non-stop flights from a range of UK airports landing in the main islands of Sal and Boa Vista, where you’ll find most of our hotel collection. Our most popular hotel is the 4.5* Hotel Morabeza on Sal. 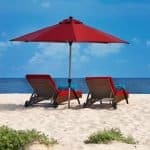 A well-established beachfront property just a short stroll from the delightful town of Santa Maria, it’s a fantastic choice for a beach holiday, and consistently receives outstanding feedback from our customers. Another choice which is perfect for a luxury beach holiday is the 5* Hilton Cabo Verde Sal Resort. The hotel boasts direct access to the golden sands, a water sports centre, Eforea Spa and large swimming pool. It’s also just a 15-minute walk from the main town. Other options on Sal include the wellness-oriented Dunas de Sal Hotel and the ever-popular Odjo d’Agua. If you prefer the flexibility of self-catering, there’s the Aparthotel Tropical, an easy 15-20 minute walk from the bars, restaurants and shops of Santa Maria. The island of Boa Vista boasts some of the archipelago’s most striking beaches, along with some wonderful wildlife-watching opportunities, such as loggerhead turtle nesting and whale watching. Offering B&B through to all-inclusive, explore Spinguera Eco Lodge for a ‘get away from it all’ tranquil escape, or the colourful and charming Orquidea guest house along the seafront. For all-inclusive, the Iberostar Club Boa Vista is found on arguably the best beach in the archipelago, Praia de Chaves. Explore the other, lesser-known islands with ease through our island hopping holidays, where you can enjoy São Vicente, the cultural heart of the destination, Santiago and its incredible history, Fogo and its magnificent volcano, Santo Antão’s jaw-dropping green peaks and São Nicolau’s natural beauty. 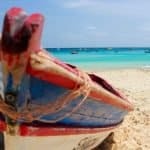 All of these islands help to bring together the destination’s true identity and offer holidaymakers the chance to experience the real Cape Verde. Find out more about all these islands and more in our guide. * Check out the best time to visit Cape Verde and see what Catherine Leech, Director of 101 Holidays, thought of her own holiday on Sal.